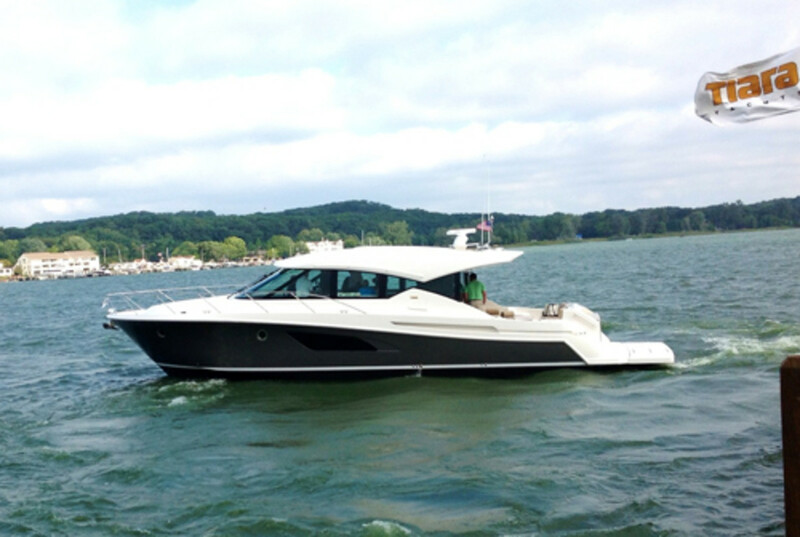 S2 Yachts debuted its 50 Coupe on Sunday during a press event at its corporate yacht center on Lake Macatawa in Michigan, marking the beginning of Tiara&apos;s modern look in its new generation of yachts. "While we have an aesthetic departure from what made a Tiara, we want to make sure that all those basic Tiara DNA elements are there so that the future customer is getting to experience ‘a Tiara,’ " S2 Yachts president Tom Slikkers said during a 10-minute presentation. "What people want today in a boat is different — how they want to use that boat is different. We need to be able to accommodate that in ways that say, &apos;Here we are!&apos; "
Along with eight other journalists, I had the opportunity Sunday morning to test the 35-knot sport yacht, which was powered with the new Volvo Penta IPS950s and D11 diesels. The boat also will be shown to about 15 dealers and potential buyers during the next few days. With its curvaceous lines and oversized hull-side windows the Tiara 50 Coupe departs from the more traditional Tiara profile. The Holland, Mich., builder has used contemporary interior elements, such as modular settees and angular door handles, but has maintained some brand design characteristics, such as the Tiara swept sheer and deck wings, 50 Coupe project manager Andrew Bartlett said in his presentation to the media members after Slikkers. Later, Bartlett outlined for me the major features and innovations he said better meet the needs of today&apos;s buyers: a center galley open to the cockpit and saloon; flexible cockpit seating; a SureShade-powered cockpit awning; a forward berth that converts from split bunks to a single berth; a glass windshield, side windows and aft deckhouse doors that deliver 360-degree visibility; and the master stateroom&apos;s hull-side windows. Tiara will show the 50 Coupe next month at the Fort Lauderdale International Boat Show. It becomes the first North American production yacht with Volvo Penta&apos;s Glass Cockpit, an integrated electronics system that collects all navigation, engine and mechanical information and delivers it to touch-screen displays from eight to 19 inches. (The 50 Coupe was outfitted with twin 15-inch screens.) Volvo Penta teamed with Garmin on this product and technology. The Glass Cockpit also includes "Joystick Driving" technology, which allows joystick steering at high speeds, in addition to displacement and docking speeds. "We started planning with Tiara on paper and carried out a great amount of design work," Volvo Penta vice president of marine sales Marcia Kull told me. "You have to integrate early if you want to optimize the performance of the boat and propulsion system — that is what we&apos;ve done. The two companies work well together, and we are taking it to the next level." Tiara has reached a higher level from a business standpoint, too, Slikkers said. "We have all been through a tough five years," he said. "The inboard side of the segment was hammered. I want you to hear from us that Tiara&apos;s revenue [is] up this year. Retail sales are way up — way above what we expected and what the industry benchmarks were projecting. Our inventory has gotten healthier. I am proud to tell you we are back — we are gaining some muscle again. This product is the tip of the iceberg." The more modern design and styling also will be used in other coupe-style yachts from about 36 to 60 feet, Slikkers said. “There will be more to come,” he told me. The market dictated the changes — necessary to attract younger buyers who want designs and interior layouts that promote social interaction, he said. "But there is a need for us to remember all of the aspects that made us an aspirational brand," Slikkers said. "There is a reason why some people have bought four, five and six Tiaras." The Tiara&apos;s rugged, seakindly ride ranks right up there. In an upcoming Trade Only Today report, I&apos;ll tell you about my sea trial and walk-through of the 50 Coupe. Does it measure up with its predecessors at sea? Base price of 50 Coupe with twin IPS 950s with Joystick Plus: $1,377,725.